British registration marks come in three different flavours, two older diamond-shaped designs and a newer and much simpler registration number; all three versions can be found either included into the mold of an item or simply stamped onto the item itself. As the name implies, a 'registration mark' only states when a specific piece or design was registered and does not indicate the production date of the item. While the majority of registered designs were indeed taken out by English manufacturers, some were registered by foreign companies or their agents. Hence one should not simply assume that all objects bearing this device are automatically of English manufacture, in fact that actually explains why this page is included on a website featuring German and related marks: some German manufacturers indeed registered designs in England, thus one may sooner or later stumble across the one or other German item with such a registration mark. As mentioned before, there are two versions of the diamond-shaped mark. If you are looking at one, simply check out the bottom part of the mark: a type 1 mark (1841 to 1867) shows a number there while a type 2 mark (1868 to 1883) features a letter. After having identified the mark type itself, reading the rest is simple. 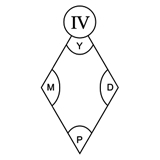 The type of material was stated by a roman numeral class number in the top circle (I for metal, II for wood, III for glass and IV for all kinds of ceramics). In the four corners of the diamond itself you will find four different numbers or letters. In the pictures shown here, the placeholders used are P for package number, Y for the year, M for the month and D for the day of registration. In direct comparison one can easily recognize that the fields P and M as well as D and Y were exchanged in the newer (type 2) version. Used 1841 to 1867, placeholders 'Y-D-P-M' clockwise from the top. Used 1868 to 1883, placeholders 'D-Y-M-P' clockwise from the top. The placeholder P (package number) is sometimes also referred to as 'bundle number' or 'manufacturer number', the latter being not quite correct. One has to know a little about the methods of filing and storing documents at the registration office during that time to understand the true meaning of this code: all registrations of one day were filed in one 'package' or 'bundle', meaning that they were wrapped and stored together while the contents (each registration and registrar from the package) was written down in the filing ledger. In some (rare) cases all registrations from a certain day were filed by one specific manufacturer only, this however does not mean that a certain number code keys to the name of a certain registrar. With other words: this part of the registration information is irrelevant for collectors or people simply wanting to find out more about their item as it is merely a filing reference. Here is a table that shows the known month and year codes; take note that the month code letters were identical in both mark type periods. Also make sure to check the two exception warnings placed below which should at least show that the system was not foolproof. Exceptions (1841-1867): In the year 1857 the letter 'R' was used between 1st and 19th of September, during 1860 the letter 'K' was used between 3rd and 31st of December. In both cases the clerks simply forgot to change the letters. Exceptions (1868-1883): Between the 1st and 6th of March 1878 the letter 'W' was used for the year instead of 'D' and 'G' was used for the month in place of 'W' as the clerks had confused the respective year/month codes. From January 1st 1884 onwards, registrations were represented by a much easier marking type that consisted merely of the actual registration number, prefixed with 'Rd' or 'Rd №.'. The following list of numbers is a pretty good reference, the number shown was the first number issued in January of a given year.